The old GitHub repositories will still be available for a limited time, but no pull requests will be accepted from GitHub anymore. The migration to GitLab was planned since October 2018, but postponed until completing the PixInsight 1.8.6 release. If you are one of our collaborators, or if you want to collaborate with us from now on, please create a GitLab account (it's free) if you don't already have one, then join us by letting me know your GitLab user name. If you have contributed code to PixInsight, better use the same user name as on GitHub, so your commits can be associated with your new GitLab account. If you were following some of our repositories on GitHub, please follow them also on GitLab. Installation packages for a new version of PixInsight are now available to all users: 1.8.6.1457 for Linux, macOS and Windows. This is a bugfix/update release. It solves all confirmed bugs discovered since the initial 1.8.6 release and provides important new features, which I'll describe succinctly in this document. 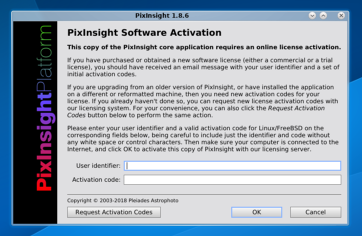 As most new versions of the PixInsight core application, this one is not available as an automatic update. You have to uninstall the previous version, be it 1.8.6 or an older one, then download and install the new version manually. Of course, if you have already activated version 1.8.6 on your computer, no additional license activation will be required. All platforms: All bug fixes in the previous 1.8.6.1448 version are included. All platforms: Fixed a regression in core screen rendering routines that was causing sporadic segmentation faults, especially with relatively large images (16 Mpx and larger). All platforms: Fixed a regression in core screen rendering routines that was causing sporadic segmentation faults with masked images. All platforms: A rare race condition in the core event loop was causing sporadic segmentation faults when changing the current workspace by clicking on a workspace selector (the small square gray icons on the bottom tool bar). This has been fixed. All platforms: When the on profile mismatch policy is convert to the default profile (as defined in global color management preferences), images with mismatched ICC profiles were not being converted to the default profile, that is, the policy was not being applied. This is actually an old bug that was introduced as a regression in one of the latest 1.8.5 versions, and had passed unnoticed. See the original bug report. All platforms: Loading CFA raw frames with the new RAW module was leading to excessive memory consumption (2-4 times more memory than what is strictly necessary, depending on RAW settings). This is now fixed. All platforms: White balance settings were not being applied to raw CFA frames loaded with the new RAW module. This works now as expected for all raw frames, included Bayer and XTrans CFA patterns. See the original bug report. All platforms: The HistogramTransformation tool was causing a segmentation fault under very special conditions (the HT tool is open with track view enabled on a hidden workspace with an active grayscale image, then the workspace in question is activated, a different color image is selected by the user, and this causes HT to segfault). This obscure bug has not been reported by users. We have discovered and fixed it during the intensive stress tests we have applied to version 1.8.6. All platforms: Project files opened from the File Explorer window, or with the open command from the console, were not being added to the list of recently opened project files (File > Open Recent > Project Files). This is now fixed. Windows: The SubframeSelector tool was crashing the WebView control included in its Measurements window quite frequently on Windows (more or less frequently depending on graphics drivers). As a result, no more graphics could be generated after the crash unless the core application was restarted. Actually, the same potential problem was present on all platforms, but its incidence was very small on Linux and macOS. This bug has been reported in multiple occasions. With the changes I have implemented in this version, this problem should not happen anymore under normal working conditions. macOS: Script windows and other dialog windows were not resizable when they should. This is now fixed. See the original bug report. macOS: Top-level tool windows were being maximized spontaneously by the Cocoa window manager (NSWindow class), especially when changing the current workspace, and when windows were minimized and then restored immediately. This should not happen anymore with the changes I have implemented in this version. Bundled projects. Projects can now be generated packed into single folders with the .pxiproject suffix. 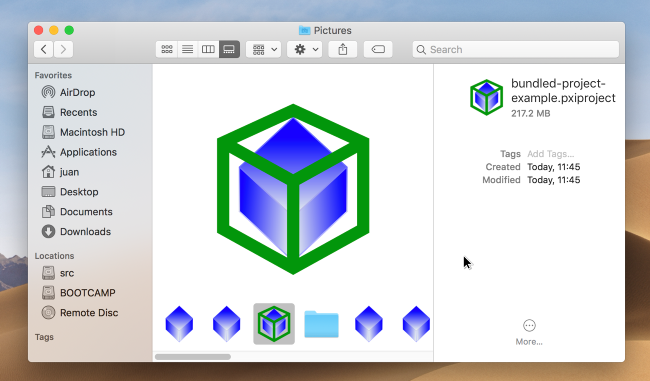 This integrates naturally with macOS (where document packages are supported natively), and also integrates well on Windows and Linux with the KDE desktop environment. This is a very important new feature requiring a thorough description, which I'll post on the release information forum board. Screen rendering routines are now faster, especially for representation of reduced images (zoom ratios 1:2 and smaller). This is an initial improvement that will be followed by additional, more significant ones in the next version. These improvements are necessary to support the new mosaic generation tool, where we'll have to work fluently with very large images (for example, mosaics of several Giga pixels in 32-bit floating point format). Screen rendering performance measurements, which I need to evaluate the changes described in the preceding paragraph. You'll find them on the View Explorer window, in the render-rates section (read the tooltips for more information). Again, this requires a separate description on the release information board. New functionality implemented in the RAW module. Improved memory management. 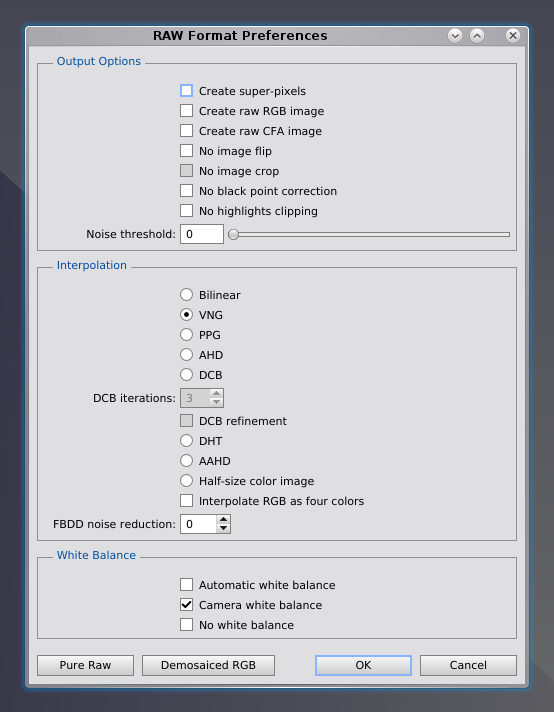 White balancing and wavelet denoising options are now fully functional for raw CFA data. useful to troubleshoot OpenGL problems, especially on Windows platforms. disabled in the integrated Chromium browser component. to be buggy or crash-prone. 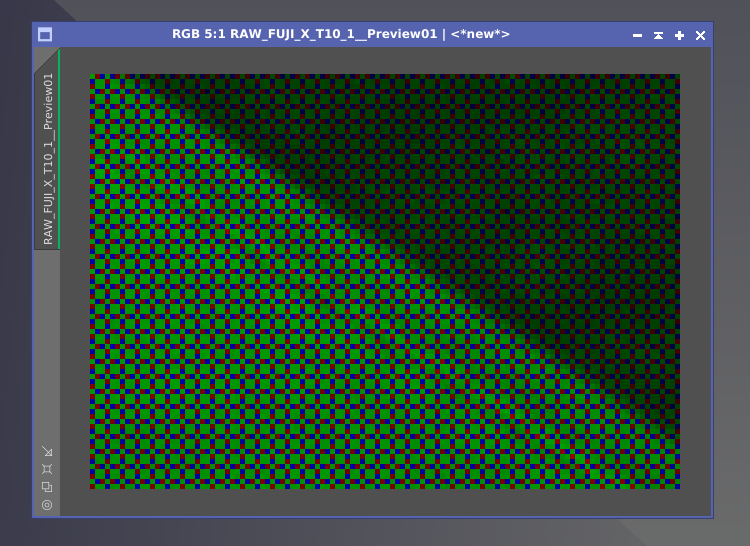 Hopefully, the --opengl=raster option will now solve most issues caused by bad graphics drivers on Windows, although really bad drivers may continue causing some problems. Problems caused by misbehaving 'utility' applications, poor virus protection programs and wrong/buggy Windows updates cannot be solved this way, though. Improved X11 installer program, which generates now much better MIME descriptions for file type associations and installs scalable application and file type icons (SVG format). 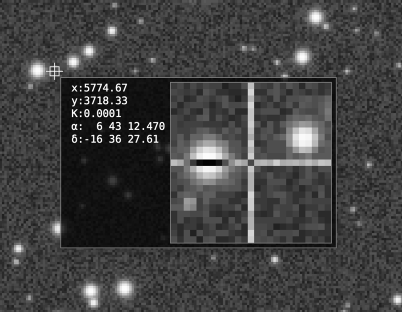 The installer also inserts the PixInsight application in the Astronomy, Science/Math and Graphics standard application categories (previously only in Graphics). Improved multiplatform directory selection dialogs. The non-native directory selection dialog can now remember its window size and side bar selections, just as regular file selection dialogs. Delta T database updated with the latest data available from IERS Rapid Service/Prediction Center online files, as of 2019 January 19. Delta T is the difference in seconds between the TT (Terrestrial Time) and UT1 timescales for a given date. It is an essential observational quantity for ephemeris calculations and reduction of astronomical positions. CIP-ITRS database updated with the latest data available from IERS Rapid Service/Prediction Center online files, as of 2019 January 19. This database provides the coordinates of the Celestial Intermediate Pole (CIP) referred to the International Terrestrial Reference System (ITRS). These coordinates are necessary to account for polar motion in calculation of topocentric coordinates of solar system objects. These corrections are only relevant for objects very close to Earth, including calculation of high-precision topocentric coordinates of the Moon (to milliarcsecond accuracy). All Linux and macOS versions of PixInsight require now support for SSE4.1 instructions. SSE4.1 is supported on Intel Core 2 (Penryn), Intel Core i7 (Nehalem), Intel Atom (Silvermont core), AMD Bulldozer, AMD Jaguar, and later processors. Some 2007 or 2008 machines could have processors without SSE4.1 support. 2006 and earlier CPUs won't support PixInsight 1.8.6. This mainly affects vintage AMD-based machines on Linux. This should have no repercussion on macOS. Asynchronous exceptions on Windows are now reported exclusively on the console window, just as happens on Linux and macOS. This should make sporadic system exceptions less intrusive on Windows. Script Editor: The Home and End keys behave now as a developer expects on macOS. The default behavior of these keys on macOS platforms, that is, move the cursor to the beginning and end of the document, respectively, is simply useless. Home and End work now just the same on macOS as on Linux and Windows, that is, move to the beginning and end of the current line, including smart Home functionality. As always, thank you for your support and patience while I work to solve problems, some of them critical. Enjoy! 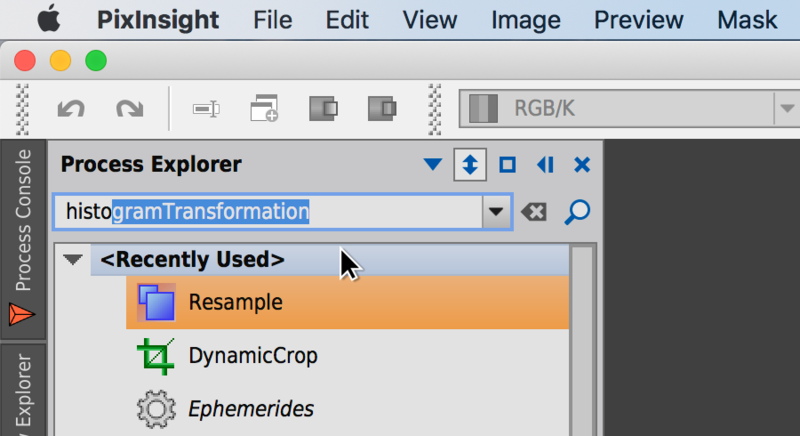 I am happy to announce that PixInsight 1.8.6 has just been released. This is a very important release with many new features and performance improvements, with a strong focus on stability and compatibility, and a much increased potential for future development. 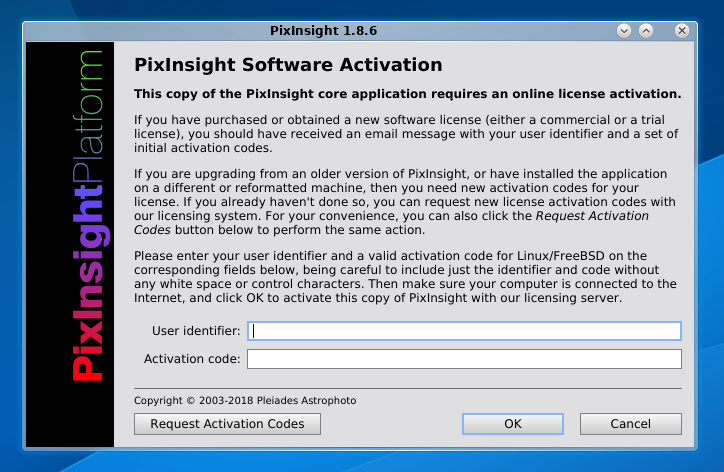 Version 1.8.6 of PixInsight requires a license reactivation for all commercial and trial users, on all platforms. Sorry in advance for this inconvenience. 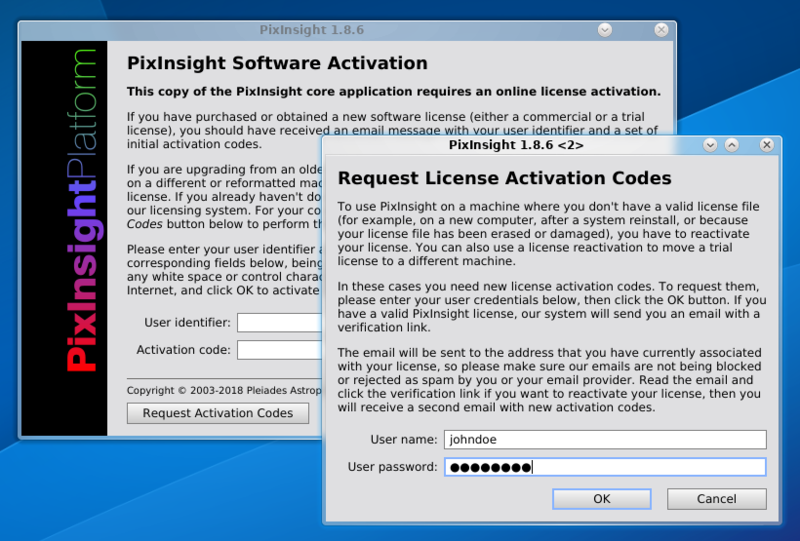 As most of you know, the trial version 1.8.5 of PixInsight was hacked past May. While analyzing the hack, I discovered several weak points in our security system that I have tried to remove in version 1.8.6. We have now a much stronger encryption and a more sophisticated and secure license validation procedure. 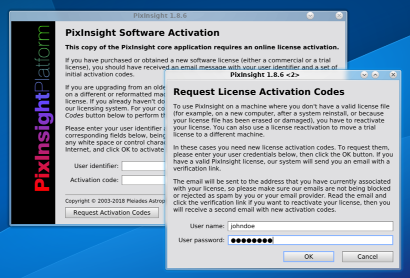 Unfortunately, the new security system requires a completely different license file encryption, which means that all existing license files won't work with version 1.8.6 of PixInsight, and hence a license reactivation is unavoidable. I have redesigned the license activation dialog to make things easier to everybody, including the possibility to request new license activation codes directly, without having to visit our website. I hope these changes will facilitate the transition to the new licensing system. To reactivate your license, it is necessary that you can receive notification email messages sent by our server. Please make sure that the email address that you have associated with your license is valid, that your email client application does not reject our messages as spam, and that your email provider does not block our messages. - On Linux and FreeBSD, on a $HOME/.PixInsight hidden directory. Previously license files were generated directly on the user's home directory. For many years I have been receiving complaints about this because of obvious security and privacy concerns, which I have tried to address in this version. Like all major PixInsight releases, PixInsight 1.8.6 also includes many new features. Let's have a look at some of the most important ones. Astrometry is now fully integrated in the PixInsight platform, including the PixInsight core application. 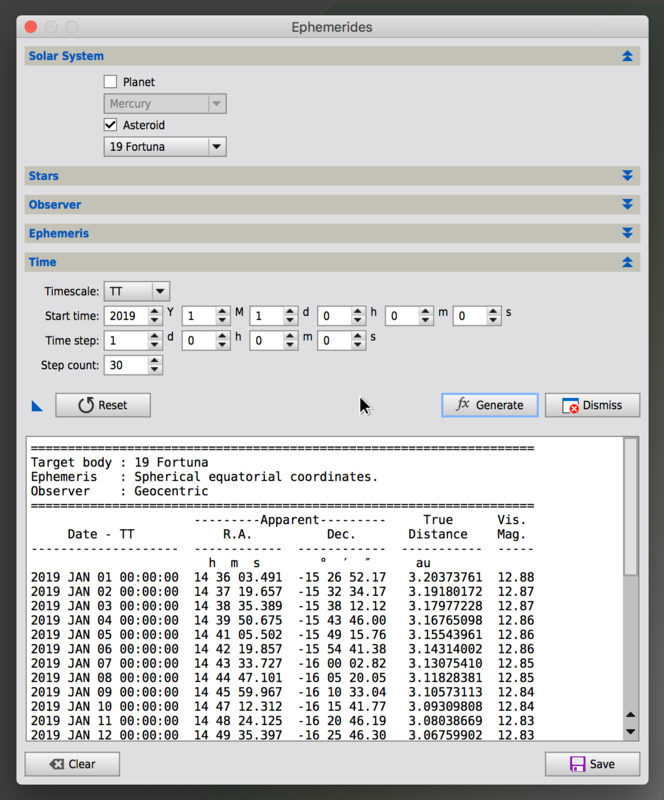 When you open an image with valid astrometric metadata (consisting of a valid set of WCS keywords and optional image properties), the application will generate an astrometric solution automatically and will show celestial coordinates on the readout preview, which opens when you click on an image in readout mode. You can configure these readouts to show equatorial, ecliptic and ICRS galactic coordinates, among other options. You have these options available in the readout menu. Astrometry integration goes much deeper than simply showing coordinates on the screen. 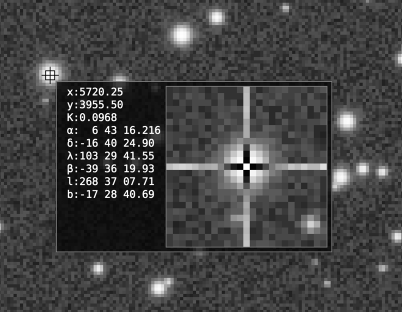 Astrometric solutions are now treated just as other ancillary data associated with images, such as ICC profiles or display functions for example, and hence are directly available to all running tools and scripts. All of this has been possible thanks to the contributions made by Andrés del Pozo to our C++/PCL development platform. The Linux and macOS versions of the PixInsight core application (and the FreeBSD version when released) are now much more robust and tolerant to critical exceptions and synchronous signals, thanks to significant changes in the internal system exception handling routines. Basically, if a SIGSEGV, SIGBUS or SIGFPE signal (among others) is generated within Qt code, from a 3rd party library, or from an installed module, the PixInsight core application will be able to handle it 'graciously' without a fatal crash in almost all cases. Being a modular platform, this improvement is particularly important for PixInsight. Of course, this has limitations, and may fail when the code involved is left in an unstable state after the exception is thrown (these things happen). At the very least, the application should be able to let you exit in a controlled way in most of these situations. For images with valid astrometric solutions, DynamicPSF now calculates equatorial coordinates for each star centroid automatically. 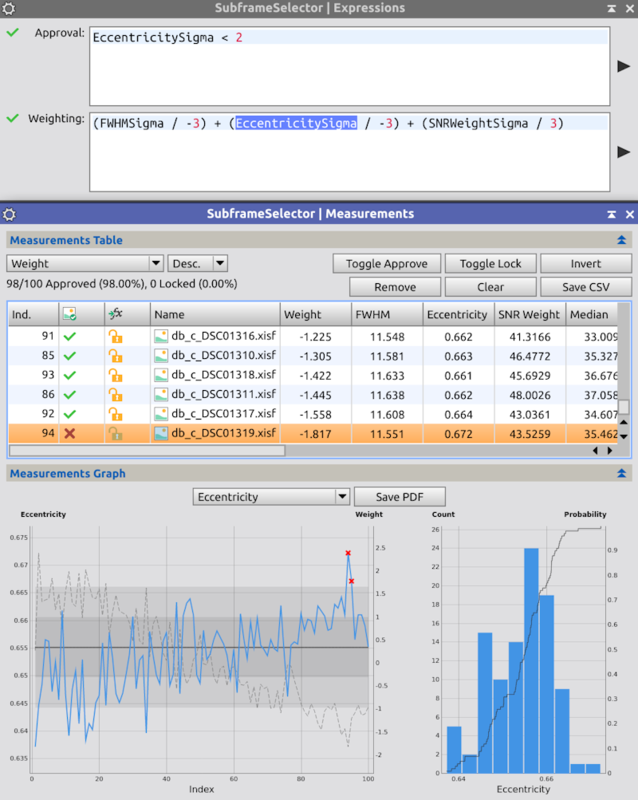 In addition, a new goodness-of-fit estimator has been implemented, which is more accurate and robust than previous versions. The new RAW module for support of digital camera raw formats is based on LibRaw (latest stable 0.19.1 release). This replaces the old DSLR_RAW module, which was based on dcraw. The use of LibRaw ensures that we'll continue supporting virtually every digital camera in the market, including the latest models from Canon, Nikon, Sony, etc., in the foreseeable future by means of new PixInsight versions and updates. The new RAW module and Debayer tool provide full support for X-Trans raw frames throughout the entire preprocessing pipeline. Images acquired with X-Trans sensors are now first-class citizens in PixInsight, from image calibration to drizzle integration. 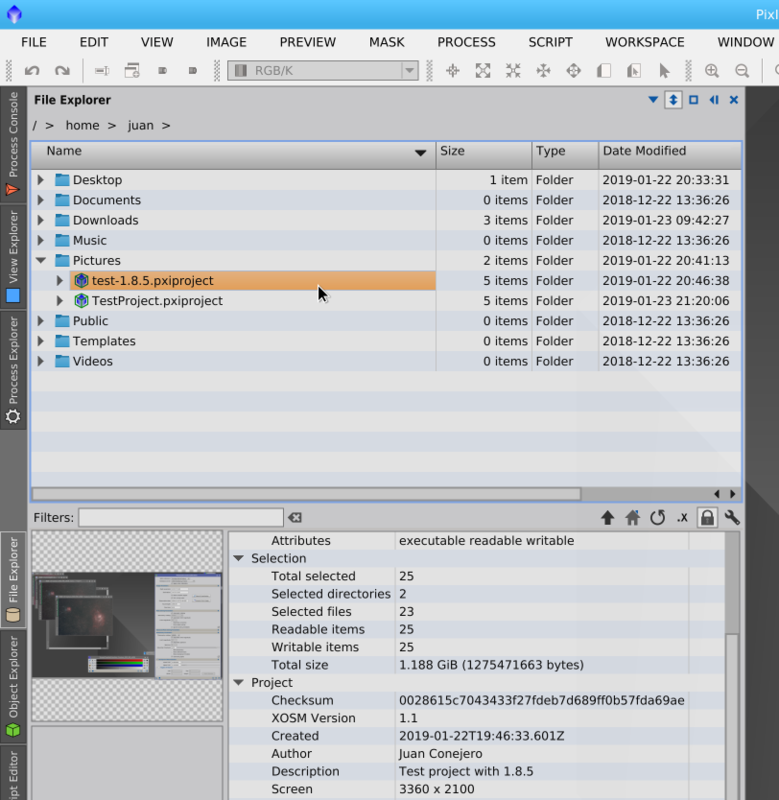 The new SubframeSelector tool by Cameron Leger (revised, improved version) is now part of the official distribution. 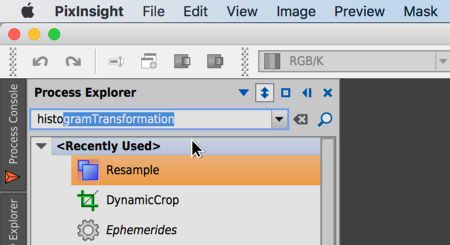 This tool, based on Mike Schuster's original work, is a high-performance data analysis tool and an essential element of any serious image preprocessing work in PixInsight. The latest version of the LocalFuzzyHistogramHyperbolization script by Frank Weidenbusch has been included in this release. This script is an excellent implementation of an advanced image processing algorithm for histogram manipulation, with outstanding and highly controllable results. This script is an exhaustive test bed for the new integrated ephemerides system. This new script calculates positional ephemerides for the main planets plus the dwarf planet Pluto, the 343 most massive asteroids, and any star available through the online Simbad TAP service. It calculates geocentric or topocentric, spherical or rectangular, true, geometric, astrometric, proper, apparent or intermediate places, and presents the result as a plain text document that can be saved as a new file. The implemented algorithms are rigorous and generate positional data accurate at the sub-milliarcsecond level, only limited in practice by the quality of the underlying solar system theories and source star data. New quick search boxes have been implemented in the Process Explorer and Object Explorer windows. These boxes are helpful to quickly locate a process or script by typing a few characters. Just click on the search box, start writing the name of a process or script you want to use, and the autocompletion feature will find it for you. Then press Enter to locate it on the process tree, and press Enter again to execute it. The Linux and Windows versions of the PixInsight core application have been built with the latest Qt 5.12.0 LTS release (long-term support release). The macOS version still uses Qt 5.11.3 because of some regressions in Qt 5.12.0 for macOS, which we hope to overcome during the next months. This version also includes the latest versions of third-party support libraries including the LittleCMS engine, cURL, LibTIFF, JPEGLib, CFITSIO, etc. Version 1.8.6 of PixInsight supports out-of-the-box the latest Linux distributions, such as Fedora 29 and Ubuntu 18. The macOS version supports Mac OS X 10.11, macOS 10.12, 10.13 and 10.14 Mojave (Mac OS X 10.10 no longer supported). The Windows version has been tested on Windows 10 Creators Update. Long-standing, severe interface issues on macOS have been fixed. The new macOS version of PixInsight allows you to work normally with icons and drag/drop items, just as on Linux and Windows. Finally, all confirmed bugs, compatibility and performance issues have been fixed on all platforms. * No FreeBSD version for now. Sadly, once more I have been unable to build this version on FreeBSD. The only problem is Qt, and specifically the QtWebEngine module, which cannot be built on this platform. Of course, I keep trying, and I hope to be able to release a 1.8.6 version for FreeBSD in the coming months. Unfortunately, the only Qt 5 version that worked on FreeBSD, Qt 5.9, has been replaced with newer but completely useless 5.10 and 5.11 versions in the ports collection. This release would not be possible without the help and support of a group of friend users and developers, who not only have helped me in testing and evaluating this new version, but have been supporting my work on PixInsight, in some cases for many years. I want to make special mention of the following people (in alphabetical order): Enzo De Bernardini, Warren Keller, Klaus Kretzschmar, Cameron Leger, Harry Page, Vicent Peris, Rob Pfile, Andres del Pozo, Bob Rieger, Niall J. Saunders, Mike Schuster, Mark Shelley, Mike Smythers, Rick Stevenson, Thomas Stibor, Alejandro Tombolini, Georg Viehoever, and Frank Weidenbusch. Also a big thanks to Peter Polakovic and Rumen Bogdanovski, the core developers of the INDIGO initiative, for their invaluable help with the ongoing implementation of INDIGO support in our INDIClient module, developed by Klaus Kretzschmar. INDIGO is a crucial element in the future of astronomical instrumentation; for sure we'll see great new development projects in PixInsight around INDIGO in the coming months thanks to this collaboration. Finally, I cannot end this announcement letter without a very special mention to Sander Pool, who passed away on January of this year. A highly respected member of the astronomy community, a great supporter of PixInsight since the beginning, a great friend of all of us here and on many public forums, a bright person, always ready to help. We miss you, friend. As any new version of PixInsight, this one has been made to increase your enjoyment of astronomy. So please enjoy it! Happy Holidays and a wonderful new year 2019 to everybody! Announcements / Happy New Year!